“If Edison had stopped trying, he never would have discovered what it was that made his past attempts fail. And if Jordan had been too embarrassed to keep playing, he never would have honed his basketball skills. When you stop attempting, you stop learning and developing. You become stuck in the past, and you’ll either stay mediocre or have someone who’s willing to make mistakes move forward and quickly replace you“. Thomas Edison is said to have failed 10,000 times before he successfully invented the first practical, long-lasting electric light bulb. Basketball star Michael Jordan once publicly said that he had missed 9,000 shots, lost almost 300 games and blundered 26 game-winning shots during his long career. Despite their many failures, these two men, who were successful in very different fields, are regarded as tops in their fields. And it was their tenacity to keep going that led to their success. If such legends as Edison and Jordan prove that failure is a prerequisite for ultimate success, why are people so scared to fail? In Timothy Ferris’ best-selling book The 4-Hour Workweek, Ferris asks the terrifying question, “If you chase your dreams and fall flat on your face, worst case scenario, how long will it take you to recover?” Your worst case scenario probably won’t turn out as bad as you imagine, but it’s this imagined failing that will keep you stagnant and not fulfilling your potential. 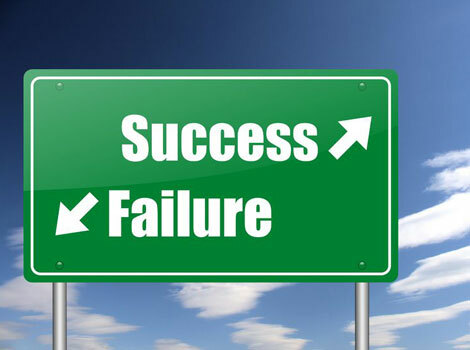 According to a study of business owners by researchers Francine Lafontaine and Kathryn Shaw, those who started companies again after previously failing were more successful because they learned from their past mistakes and took more chances to prove themselves. The researchers found that the probability of a failed establishment decreased by 7 percent if it was started by someone who had owned even just one prior business. Learning from our mistakes sounds like common sense, but why have we been programmed to fear failure so much that it stops us from achieving our highest potential? Part of this can be blamed on what we were taught while growing up—that there’s only “one right answer” to any question, as Sir Ken Robinson pointed out in his wildly popular 2012 TED Talk. When kids are taught that mistakes are the worst things you can make, they stop exploring because they’re frightened that the answer they come up with might be wrong. To change this kind of thinking in our brain, we need to flip the script on failure. Stanford University psychologist Carol Dweck says young people today have been raised with the idea that in order to be a winner, you can’t be a loser. If you fail, most people think of this as losing. That’s the key difference between the brain waves of people with growth mindsets versus those with fixed mindsets, says Dweck, the author of Mindset: The New Psychology of Success. According to Dweck’s series of studies, participants with growth mindsets were taught from an early age that their hard work would lead to success. Due to this way of thinking, these participants are prone to taking on challenges and trying new things to improve their chances of success. On the other hand, those with fixed mindsets believe from an early age that they are intelligent and are typically praised as children for their intelligence. As a result, they never want to do anything that would make them risk appearing dumb in front of others. Because they greatly fear mistakes and failure, this mindset keeps them from taking on new challenges. Ashley Good, founder and CEO of Fail Forward, a consulting organization that pushes a culture of “intelligent failure,” says we fear failure because we’re not taught how to fail. In fact, when we make a mistake, our bodies physically slump down and collapse, and many of us feel panic. Fail Forward teaches that failure can be a good thing and that productively interacting with failure starts with learning and understanding intelligent failure. Since we typically aren’t taught how to fail, we instinctively put up our guard and are defensive when we do fail. But this isn’t the right way to think, Good says. Good teaches that individuals and companies need to begin reacting with appreciation when people fail. For example, when you realize that you’ve made a mistake, physically react by shouting for joy or throwing your hands up in the air in triumph. Do the same for your employees, and pretty soon, they’ll start embracing smart risk-taking as well. The truth is, failure may never be what we hope for, but we can learn to make the most of it because it may heavily affect our business success. According to the most recent data from the Small Business Administration, one-third of all new businesses shut down within two years, and at the five-year mark, half will be deemed a failure. While these numbers aren’t pretty, these failures are needed for real growth: According to the study from Lafontaine and Shaw, an owner’s prior experience at starting a business—even a failed one—increases the longevity of the next business opened. We all fear failure at one time or another. We’re afraid of standing in the open as everyone judges our mistakes and less-than-perfect moves. But this fear is the single biggest reasons leaders stop learning and adapting to changes. If Edison had stopped trying, he never would have discovered what it was that made his past attempts fail. And if Jordan had been too embarrassed to keep playing, he never would have honed his basketball skills. When you stop attempting, you stop learning and developing. You become stuck in the past, and you’ll either stay mediocre or have someone who’s willing to make mistakes move forward and quickly replace you.